"And ye also shall bear witness, because ye have been with me from the beginning." Lucy Mack Smith was born July 8, 1775 at Gilsum, Cheshire County, New Hampshire, the youngest of Solomon Mack and Lydia Gates' eight children. Solomon was a soldier in the French and Revolutionary wars, and Lydia was a school teacher. The Mack's were poor, but Lydia educated her children and reared them in a traditional Protestant household. Solomon continually reinforced the importance of prayer in his children. When Lucy was 13-years-old her sisters, Lovisa and Lovina, contracted tuberculosis (then called consumption). She devoted herself to nursing them until their death's six years later. Lucy suffered severe depression after her sisters' passing. Lucy's brother Stephen invited her to live with him in Tunbridge, Vermont hoping the change would lighten her mood. While in Tunbridge she met local farmer, Joseph Smith Sr. After a one year courtship, they married on January 24, 1796. Joseph and Lucy Smith would have ten children: Alvin, Hyrum, Joseph Jr., Samuel H., Ephraim, William, Don Carlos, Sophrona, Catherine and Lucy. Unfortunately, she would bury six of her seven sons. Alvin, Samuel and Ephraim died of illnesses, Don Carlos died as a result of mob violence and Hyrum and Joseph were shot to death at Carthage jail. Lucy and Joseph Sr. operated a prosperous farm in Tunbridge for six years until crop failures forced them to sell. In 1802, the Smiths moved to Randolph and opened a mercantile store. Unfortunately, the store failed. Destitute, the Smiths moved to Palmyra, New York in 1816. It was their eighth move since they married. When Lucy arrived in the Palmyra area, she only had nine cents remaining - about enough in today's money to buy two Happy Meals. They soon earned enough money to buy 30 acres. While Joseph Sr. and sons cleared the land to start a new farm, Lucy painted oilcloth coverings to earn money. Lucy was very spiritual and had great faith. She read the Bible to her children, and had a testimony of the power of prayer. This was reinforced by three miraculous healings Lucy had been part of, including Sophronia's bout with Typhus Fever in 1813, and her own Tuberculosis when she was 27-years-old. In 1819, Lucy and a few of her children started attending a local Presbyterian church until Joseph's first experience with the angel, Moroni in the mid 1820's. In 1820, Lucy's son Joseph Jr. told her a story about God, The Father, and Jesus Christ appearing to him while he prayed in the woods. Lucy believed her son's story. From then on she'd be identified with her inspiring support of the Restoration. Lucy and Joseph Sr. were baptized when the Church of Jesus Christ of Latter-day Saints was organized April, 1830. Lucy became a mother figure for members of the church because of her kindness, generosity and firmness of faith. Members affectionately referred to her as Mother Smith. Lucy wouldn't back down even when confronted. Once, Reverend Ruggles, a pastor of a Protestant church in Pontiac, Michigan, was introduced to Lucy and immediately began attacking Joseph Jr.
"And you are the mother of that poor, foolish, silly boy, Joe Smith, who pretended to translate the Book of Mormon," he asked? "I am, sir, the mother of Joseph Smith; but why do you apply to him such epithets as those?" "Because," said Reverend Ruggles, "that he should imagine he was going to break down all other churches with that simple 'Mormon' book." "Did you ever read that book?" Lucy asked. "No, it is beneath my notice," he retorted. Lucy responded resolutely, "…that book contains the everlasting gospel … and was written for the salvation of your soul, by the gift and power of the Holy Ghost." "Pooh," he scoffed, "nonsense—I am not afraid of any member of my church being led astray by such stuff; they have too much intelligence." Lucy prophesied to him, "Now, Mr. Ruggles, mark my words—as true as God lives, before three years we will have more than one-third of your church; and sir, whether you believe it or not, we will take the very deacon, too!" Two months later, Jared Carter was sent on a mission to Michigan. Jared converted seventy people from Reverend Ruggles church including the deacon, Samuel Bent, who remained an active member of the church. Lucy Smith and her family followed the saints from New York, to Ohio, then to Missouri. There Lucy and Joseph Sr. suffered horrible persecution along with the other saints. They watched friends and family tarred & feathered, assaulted, and watched Joseph Jr. get marched off at gunpoint to Liberty Jail. Lucy and Joseph Sr. were falsely told that Joseph had been murdered. The shock was too much for the elder Smith and his health failed. In 1839, the Smiths fled Missouri to Illinois with the saints. Joseph Sr. died not long after on Sept. 14, 1840. In Nauvoo, Illinois, Lucy lived with Joseph Jr. and his wife, Emma. In June 1844, Joseph was arrested for ordering the destruction of the printing press of a dissident newspaper. Joseph was being held in the Carthage, Illinois jail awaiting trial. His brother, Hyrum was visiting him when an armed mob stormed and shot the brothers to death. "swallowed up in the depths of my afflictions; and though my soul was filled with horror past imagination, yet I was dumb, until I arose again to contemplate the spectacle before me. Oh! at that moment how my mind flew through every scene of sorrow and distress which we had passed together, in which they had shown the innocence and sympathy which filled their guileless hearts. As I looked upon their peaceful, smiling countenances, I seemed almost to hear them say, 'Mother, weep not for us, we have overcome the world by love; we carried to them the gospel, that their souls might be saved; they slew us for our testimony, and thus placed us beyond their power; their ascendancy is for a moment, ours is an eternal triumph.'" Adding insult to injury, her son Samuel died one month later due to an illness he contracted while escaping from the mob that murdered his brothers. William was now her only living son. 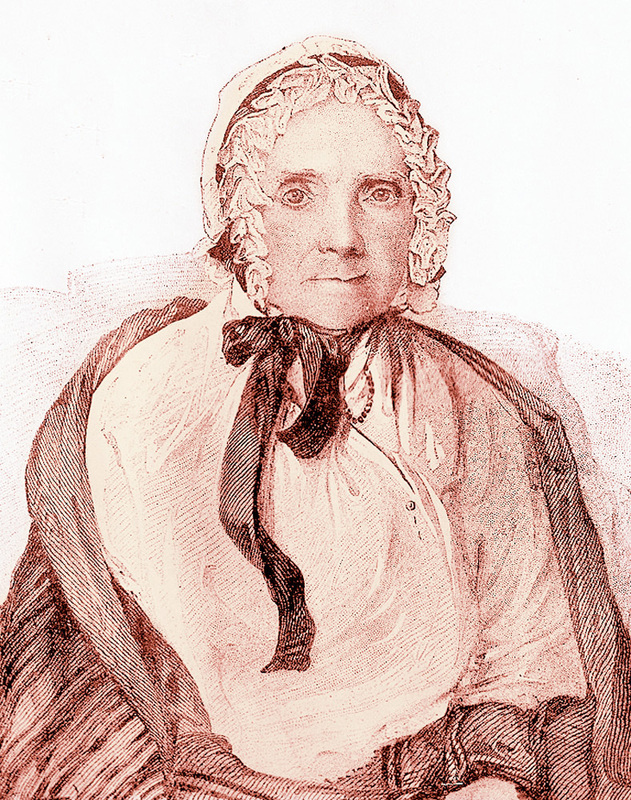 Lucy Smith continued to live with Joseph's widow Emma. Lucy intended to follow the saints to Utah with Brigham Young, but she was too old a frail. She died at home in Nauvoo in May 1856, at the age of 81. After Joseph Jr. was given the plates by Moroni, he sometimes hid them at his parent's house. Lucy Mack Smith was asked if she ever saw the plates during this time. "I asked her [Lucy Smith] if she saw the plates. She said no, it was not for her to see them, but she hefted and handled them." It's hard to heft and handle something that doesn't exist.